On Tuesday, February 21st, 2017, APWA held it's annual networking event at the Applebee's near Washington Ave. and the Commons Hotel. For those who attended, we hope you enjoyed yourselves and had a wonderful experience; for those who couldn't make it, opportunities to get involved are still available. The officers would like to thank everyone for showing up and making our first event of the calendar year such a success! The attendance rate was stupendous and we had a lot of attendees in which it was their first event with us. There was also a large variety of academic experience present, from Professional Engineers, Engineer's-In-Training, upperclassmen and underclassmen. We highly encourage all ranges of students to attend as many events as possible because all of our events are beneficial to one and all! We hope you all can make it to the rest of our events to enjoy the perks of being a member and each other’s company. 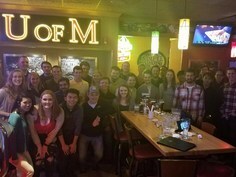 For those who are curious, APWA is a great group to join so email apwa@umn.edu for more information!! Thanks again for everyone who showed up and we wish you good luck on your internship/full-time position searches!